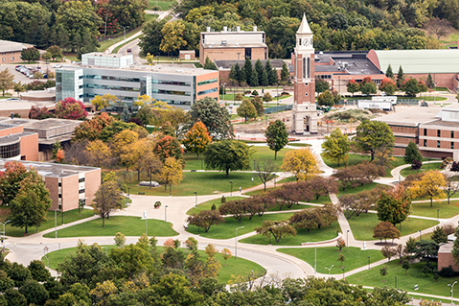 Rochester Hills-based Oakland University has announced a $150-million fundraising campaign, the largest in the school’s history. It has raised more than $50 million in the campaign’s quiet phase over the past two years. OU leaders hope to raise the $150 million by 2024. The campaign, which is called “Aspire. Advance. Achieve.” focuses on student success; teaching, research, and discovery; community collaboration; campus expansion; and innovative programs. About 66 percent of OU undergraduate students receive scholarships and grants, and almost all students at the institution work one or more jobs. Nearly 30 percent of the university’s students are first in their families to attend college. “Every dollar here is maximized,” says Ora Hirsch Pescovitz, president of OU. “Every dollar here goes further and faster, and every dollar here is put to work immediately. Investments in Oakland benefit not only our students, and not only our university, but also our community. One gift of $1 million came from the Ted Lindsay Foundation. Ted Lindsay is a former Detroit Red Wing, and his gift will go to the Oakland University Center for Autism Outreach Services (OUCARES). The center will change its name to the Joanne and Ted Lindsay Foundation Autism Outreach Services at Oakland University. The center plans to use the gift to offer pre-employment training and develop social programs for teens and adults impacted by Autism Spectrum Disorder (ASD). It will also enhance programming for parents and caregivers of those with autism, allow the center to bring ASD speakers to campus, and provide scholarship funding. The foundation has funded academic research and the continued work of autism programs around Michigan and across the country since 2001. The Center for Disease Control and Prevention estimates that at least one in 59 children are diagnosed with an ASD, a number that continues to grow. The foundation was established by Lindsay and John Czarnecki, whose son has autism. It has raised more than $4 million with 13 percent allocated toward operating expenses. The donation to Oakland is the foundation’s second gift in excess of $1 million in less than two years following the creating of the Ted Lindsay Foundation HOPE Center at Beaumont Children’s Hospital in 2016. The foundation’s mission is to elevate public awareness regarding the need for increased funding and support for individuals with autism. OU has offered an autism endorsement certificate for more than 30 years. The program has evolved into the center. OUCARES is the outreach services of the center and offers practicum training and internship placements for 10-25 students each year. It serves more than 2,300 individuals impacted by ASD annually through recreational programs, camps, and events.